Business first. Eleanore has won the giveaway for the fingerless gloves. Congratulations! But we’re not done, watch here as plans unfold and take shape. It’s time to come clean and admit that I am what someone called a pattern hugger. I would give her credit for coining this phrase, but I don’t remember who it was. 60, what do you expect. So what is a pattern hugger? A knitter who follows a pattern by the letter, and if you’re me you might even get the same yarn and colors. Now that makes perfect sense to me. I browse for hours on ravelry. Now there’s a place I deposit hundreds of hours of my life. And then from one second to the next, kapow, here is what I want need to knit. I fall in love with the whole thing. Including colors. But there has been a little shift in wind directions. Take the Jimi Shawlette started and finished recently. Add to the mix a Zuzu’s Petals. Do a mashup and what do you get? A Zuzu and Jimi baby. It’s wet blocking right now as I write this. There’s still some tweaking to do before it’s perfect and I’m happy. But you see, this pattern hugger has evolved. Only a tiny bit, but she’s moving along now. This prototype will go in a giveaway box for now. What precipitated this change? Loving the Zuzu’s Petals pattern but getting a little burnout at the same time. I love how quickly it knits up, and everything that knits up quickly gets my attention lately. So the idea of combining the Jimi and Zuzu was a no-brainer. Perhaps more inspiration will flow in my future. 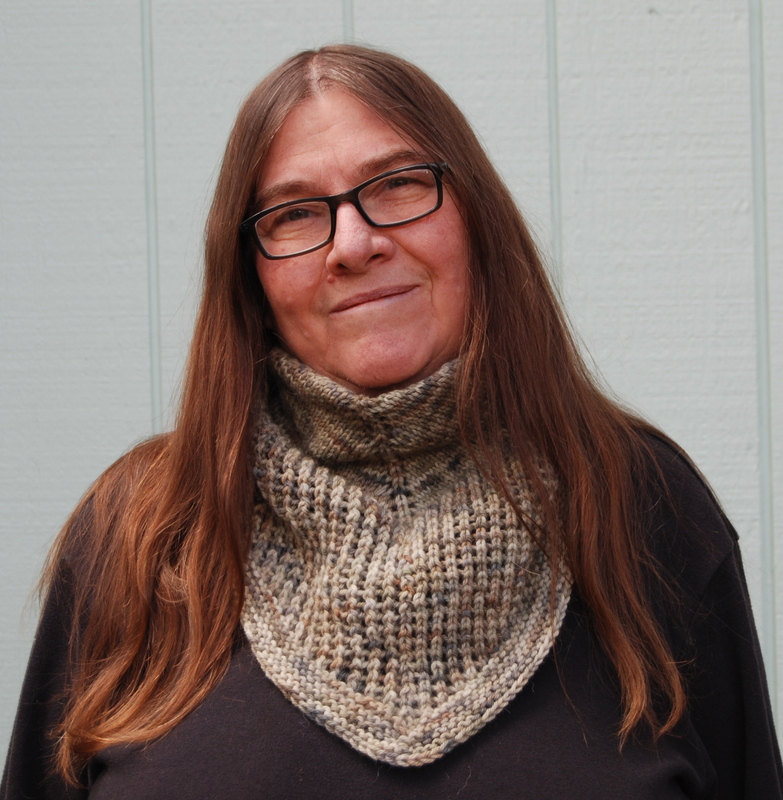 For now I reminded myself about another Haberdashery cowl I wanted to knit for the holidays. Discipline, marianna. It’s one of the knits that has a long set-up before the knitting fun begins. You cast on a million stitches and do a band of linen stitch. It takes forever, or so it seems. Once past that chore, you start enjoying the process. Somehow this was not my day for starting the Haberdashery. I cast on 197 stitches, but on recount noticed I was 10 stitches short. Not a problem, add 10. Once past the band there is a row where you decrease by one to get to 192. 192? That can’t be, that would make cast on 193. Correct. Whatever alternate universe I was inhabiting during cast on was gone. Again, no problem I’ll just decrease by 5 this round and we’re happily continuing. You think? Now we are introducing the next color and there is a pattern repeat. At the end of that never-ending row I am nowhere near where the pattern tells me I should be. Time to recount my stitches. What? 202, 10 too many. The ten I was short in the other universe showed up here. Unfortunately, yes, you guessed it, frogging I go. All evening for naught. What is the lesson here and why am I not learning it? Is this the first time I miscounted? Nope. Will it be the last time? Probably not, but I can wish, right? So let’s take one long last look at what will be no more as soon as this post is published. Just about now I switch to full panic mode. All good intentions from last year about being prepared for the holidays were not heeded. Or more likely, quickly forgotten at some time during summer. Where are all my knitted gifts? Sure, I made a lot, but mostly for fun without anyone in mind. I made socks and depending how big they got determined the recipient. Our family has all sizes, from 7 1/2 all the way up to 14, and everything in between, so how can I go wrong? Then throw in baby socks that I make from leftover yarn, socks I have absolutely no use for. And I hope to have no use for them for a while in my family. 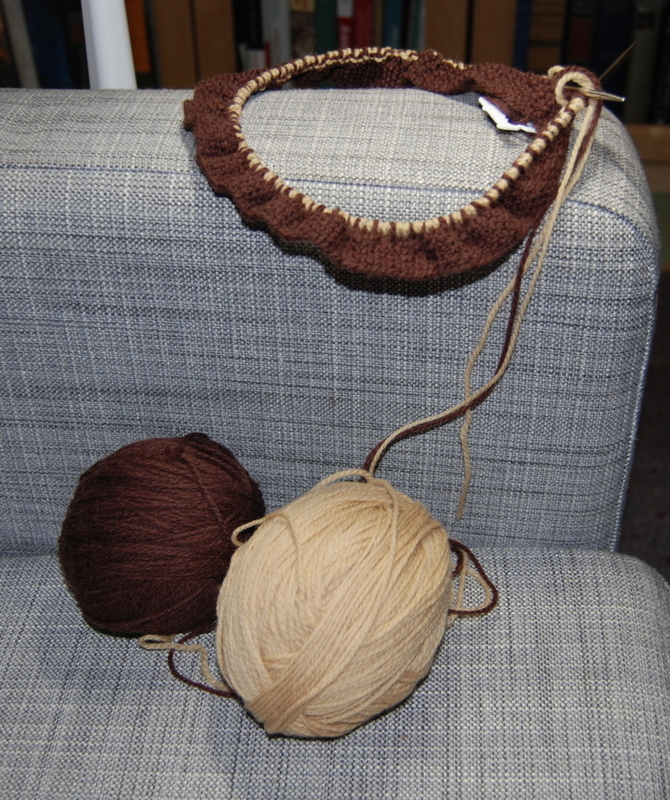 Next the cowls. I was on a Zuzu’s Petals pattern binge earlier this year. So far I’ve found 4 of them. One is definitely for me. I love the yarn from the plucky knitter and I love the yellow color. I’m finally old enough to admit that I love yellow. But mostly I’m flailing about and wondering how fast I can knit and what I can get done before the holidays. I could use several more pairs of socks. Some more Zuzu’s Petals? But my reality is sadder. Except for Liana and boyfriend there is no one in the family that appreciates a knitted gift. Stephen also excepted. So maybe I do get to relax instead of being swept up in the communal frantic search for the perfect present that no one needs anyway. I think I talked myself down and can go into this weekend with some calm and start that shawl that has been on my mind. And talking shawl, I jumped on the Jimi shawlette bandwagon. A very quick knit and it used up another skein from Stitches West. This time it was the Malabrigo Rios. I did make some changes. 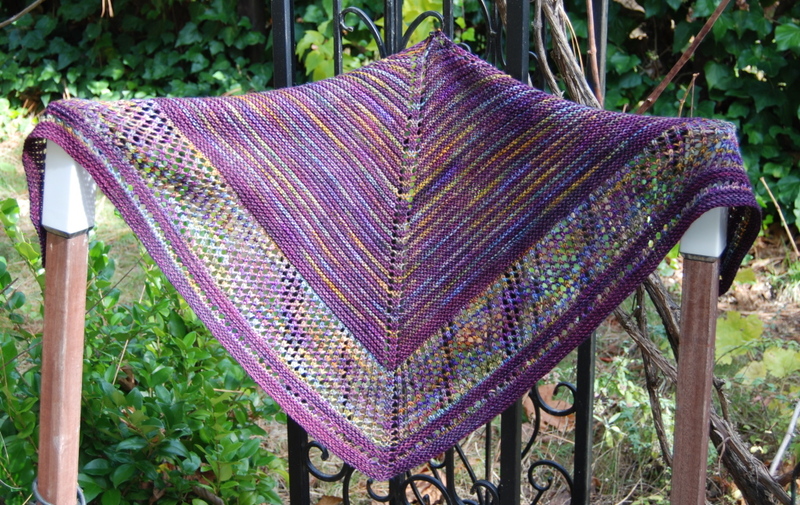 This is not a shawl but rather a shawlette. I wanted to use all of the two skeins and first made more mesh pattern repeats, and repeated another mesh pattern just before the end. There was some yarn left, what was I to do. I’m still in shock. Knitting shock. Having difficulty finding the words. No one died. Except for this lovely sweater. That sweater died this evening. Progress was so satisfying, I was so proud (hubris as it turns out), and my knitting heart was so, so happy with this sweater. I finally allowed myself to turn the pattern page to see if I am anywhere near the armholes. What? Side decreases for sweater shaping? You have to be kidding me. Starting at setup row 7? I mean, take a look, that’s all the way down to the ribbing! This is not happening. I’ve made many sweaters in the 70s and 80s that had no shaping. I just knit until it was done. A box. Why did knitting have to evolve? I tried the sweater on Stephen and no matter how I look at it or turn it or pull it lengthwise, this is too wide. It seems to expand as it grows. And remember here that this is knit in the round so you only see half of what I have to frog. I am a knitter I can deal with this. I can deal with anything. This is not the end of the world. The world is round and I will not fall off. The only thing worse than having to frog this is frogging it and then seeing I didn’t need to. OK, I can dream. But before frogging I will highlight the pattern and read and reread since I am sure there are other opportunities to screw this up. It’s time to cast on a new pair of socks as a consolation prize and to calm me down. Perhaps a little yarn shopping? Nah…. 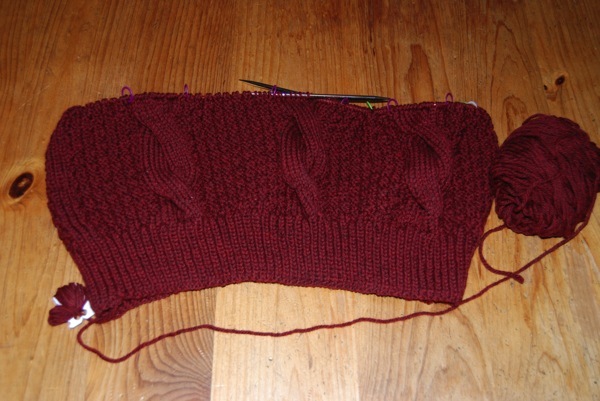 Hidden away somewhere is this sweater I started in the 80s and never finished. 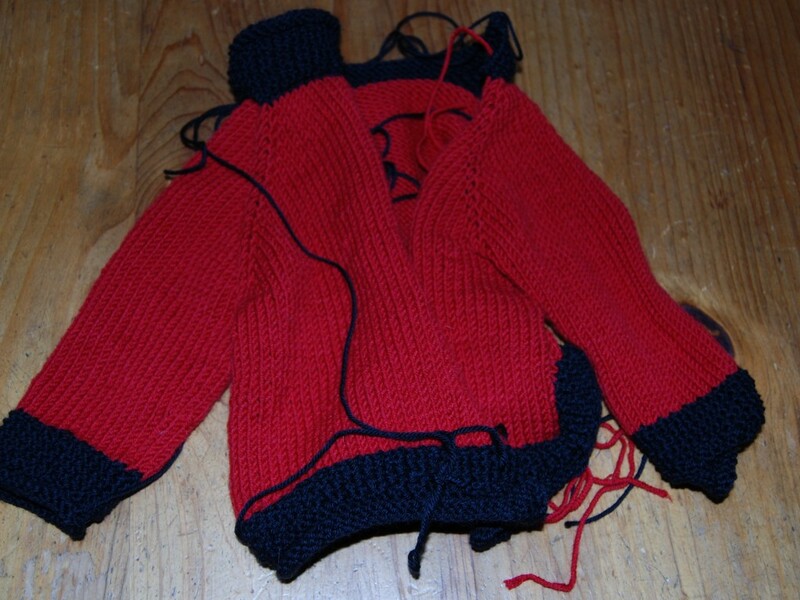 Can’t remember why, probably only needed seaming which I hated then and still do. It’s the only sweater I left behind. This will not happen to this lovely design. My daughter will wear this on the 24th of December when German Christmas and Hanukkah collide. Thought I was slacking, did you? It’s slow going and fast at the same time. 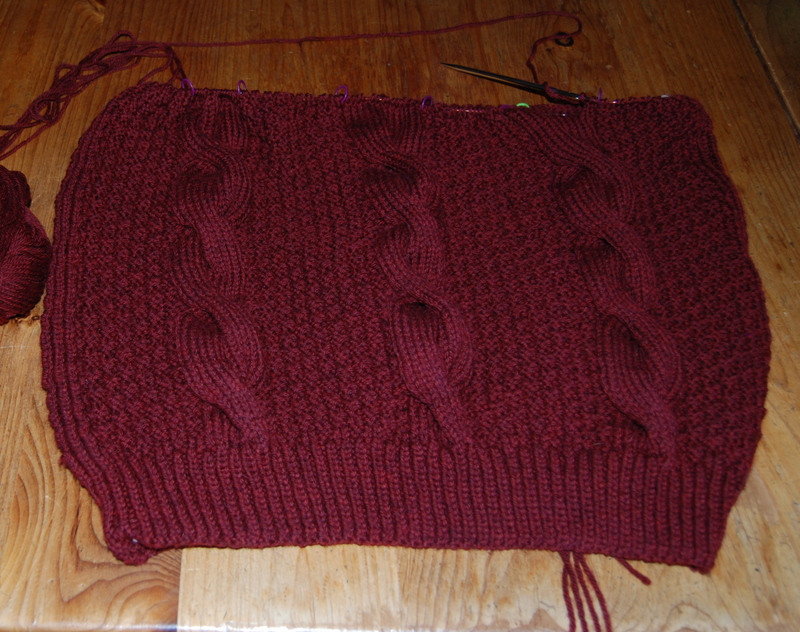 I’m on the third skein, this sweater is eating up the yarn. The pattern is repetitive enough that I’ve got it. Though that’s where the problems often slide in unnoticed. It’s not the same over and over so my hope is I can stay conscious while knitting and not sink in too deep a meditative state. It all started with a sweater pattern I fell in love with. I also loved the yarn and with a fortunate coincidence found myself in Oakland at a store that sells the yarn the sweater was made of. Getting Brooklyn Tweed shelter yarn without ordering online is not a small feat, believe me. 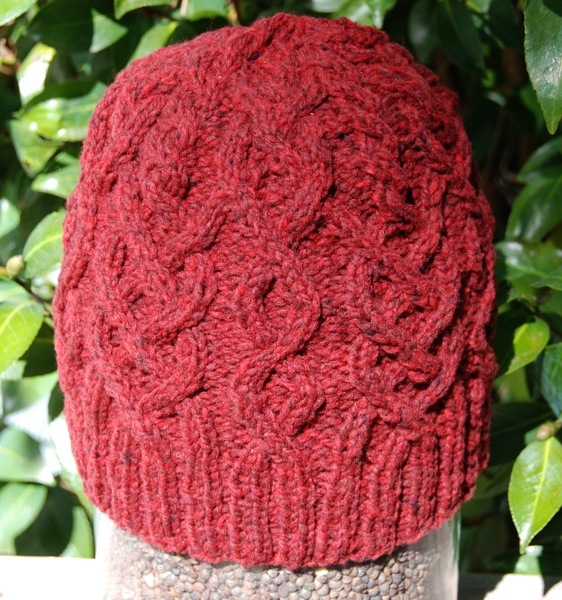 Since the yarn did not convince me to make the sweater I love, I bought some anyway and decided on a hat. It was going to be a two birds with one stone thing, though I would never kill a bird, let alone throw stones at a bird. But I would get to test knit the yarn with a pattern of Jared Flood’s. The hat is big, I knit loosely. And I made the ribbing a bit longer. Probably unnecessary. Stephen just came back from a walk and reports it itches ever so slightly but only once in a while. This might be my first finished cable item. Let’s pretend there are no mistakes and what you see is design elements added by me. 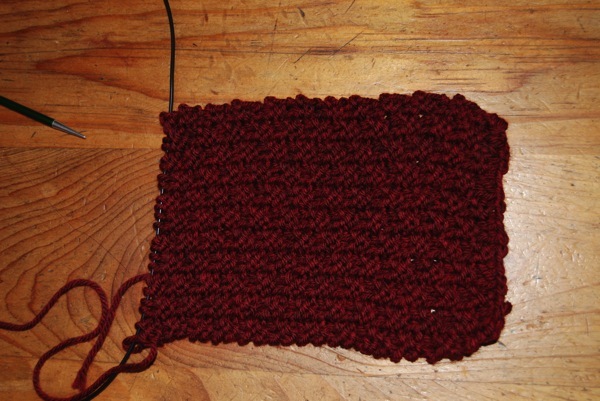 I actually signed up for a cable class with craftsy because it is my belief hope that there is a shortcut to cabling. When I get toward the end of a knitting project I start getting postpartum depression. At that time I often put down that knit and start another one. Probably for the second and third time. Don’t even think it, but yes, by that time I have also already ordered yarn to lift the mood or whatever else needed feeding. This is how my wips grow from knitting project to knitting project and my stash grows exponentially. What I don’t understand about myself is that when a project is actually finished which means all ends woven in, kitchener stitch finished socks, blocking done, buttons sewn on, etc. I feel wonderful and accomplished. Next thing that happens, I feel I’m owed a reward and go yarn and pattern hunting. So, I increase stash if I do and I increase stash if I don’t. It’s a vicious cycle I can’t seem to break. The question poses itself if I should break it. This winter when our daughter comes to visit I’ll just have to make sure she keeps on knitting. She usually does when visiting but then not when she’s away from here. But since her inheritance will be a huge yarn stash that I need to protect beyond death, I need to work on her. Should I suggest a new girlfriend that knits to our son? Nah…. that seems like going too far. He loves the one he has, and so do we, though she’ll never be the knitting type. Is it too late to adopt? I mean I’m 60 and more suited to be a grandmother than a mother. Plus, I didn’t produce avid knitters the first time around with my biological offspring. What a dilemma. And what a joyous first world problem! Hell hath no fury like me casting on. 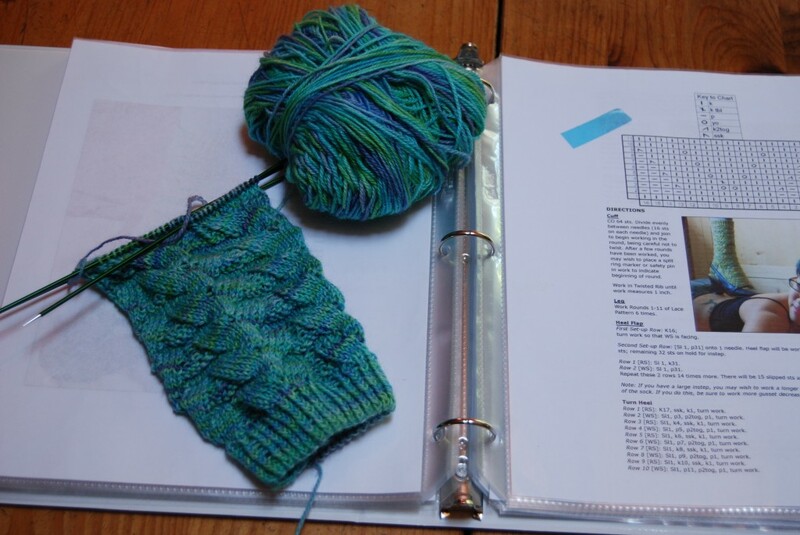 If a knitting pattern leaves the cast-on to me, I’ll use the long tail cast-on method. It’s what I’ve been taught as a child and have used most of my life. I have learned many other cast-on tricks techniques since my elementary school days in Seckenheim, Germany, and I love them all. I have no favorite, the long tail cast-on is just habit. Though I’m willing to be the sheep who follows a suggested cast-on in a pattern blindly. Who am I to question the designer. That’s the little sheep in me, follow the authority. I cast on with two needles and don’t start with a slip knot. I’m not sure why just about every youtube video or knitting book will start out with a slip knot. There might be a conspiracy. My people are looking into it. Since I cast-on with two needles I pull every stitch tight, because when I remove one of the needles the stitch has just the right looseness and the stitches stand like soldiers evenly spaced with their neighbors. But there is trouble in marianna’s long tail cast-on paradise. I pull pretty hard on those stitches and there is some yarn, actually only three so far, that breaks. The latest is Brooklyn Tweed’s shelter yarn. I think it’s the lack of twist in the yarn. 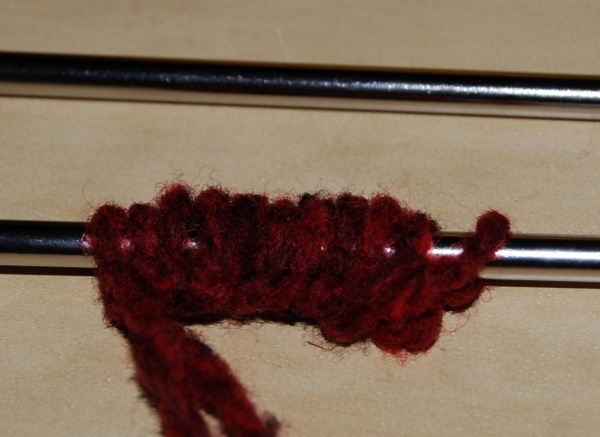 With the long tail cast-on, you are untwisting the yarn that comes from the ball. Every stitch unwinds it a little bit more, in the wrong direction of course. If you’re starting out with low twist yarn, trouble ensues, you end up untwisting the ply. And if you’re working with single ply, you can be in major breakage hell. I tried being gentle and not pulling too tight, which is very difficult since the motions I make are more reflex than thought out, so it took three cast-ons before the yarn cooperated. That makes me angry. I’m thinking about spinning the yarn again and putting more twist into it, but I guess that probably removes all the qualities the yarn offers. Knitting the yarn poses no problems so far. For Brooklyn Tweed yarns, shelter and loft, I suggest an alternate cast-on. I wish Jared Flood would actually suggest one suitable for his yarn. I am that way, wanting to be told. I am not into reinventing the wheel by trial and error. 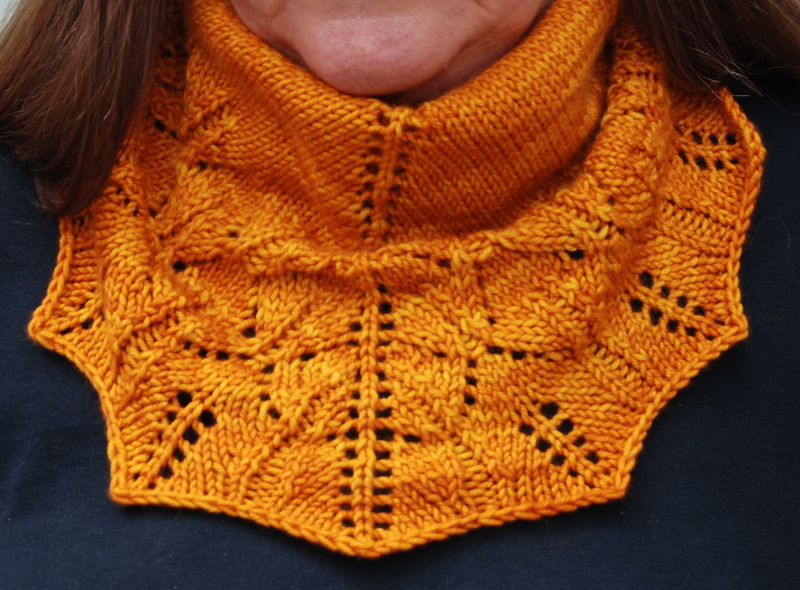 Yesterday I promised news from the good vibrations cowl. Yes, the one that started out venomous and now is a tamed pussycat with lots of goodness. Unfortunately it’s still drying and blocking. But here is a preview. Let’s all agree I didn’t make any mistakes and anything odd is a designer choice. The best news is that I have enough yarn for another one, perhaps I’ll reverse the colors? The postal carrier just came to the door with a package. It has the yarn for liana’s sweater and I’m a bit disappointed in the color. It’s not as bright as I was hoping it would be. Actually, it almost duplicates the shelter color you see above in the cast-on. 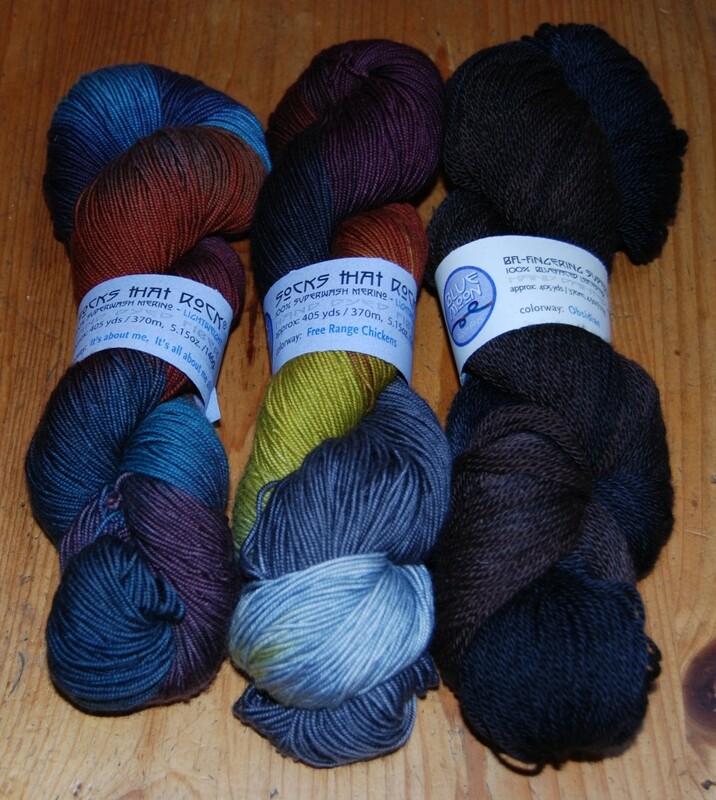 Included in the order were three skeins of yarn new to me. Not unhappy at all about them. But pictures tomorrow or after the weekend. Because we have tickets to the KVMR Celtic Festival. For a while there I was worried the festival would be smoked out, instead, perfect weather. So many posts have been started and rejected in the last few days. 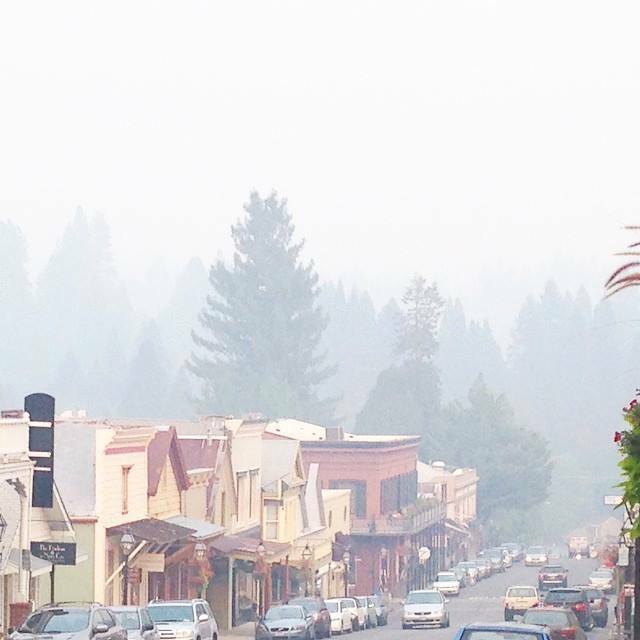 The King fire has been raging and so has the smoke in our little town, and my mood. The whole town felt crappy and I had nothing nice to say. All I could do is spit venom. This picture should give you an idea of how we all felt. A big thank you to Rick Ewald for letting me use it. And a thank you for being braver than me and going outdoors to take this picture for all of us. This morning, waking up to the sound of rain, had me opening the windows and admiring the sound closer up from under my covers. Sad to say, it’s not even noon and the rain is over. Wonder how the firefighters feel? Is it muddy? Is the rain helping extinguish the fire or just making it harder to fight? Toby’s hotshot crew is moving from the King fire to the Cascade fire. It’s only 35 acres at this point. But I believe it’s in the Tahoe National Forest and after all they are the Tahoe Hotshots. the last time I met and talked with Toby he was coughing away with a respiratory illness that he shared with the rest of the crew. I can only imagine how they sound right now after inhaling the King fire smoke up close. Somehow we should have the technology to protect our wildland firefighters. 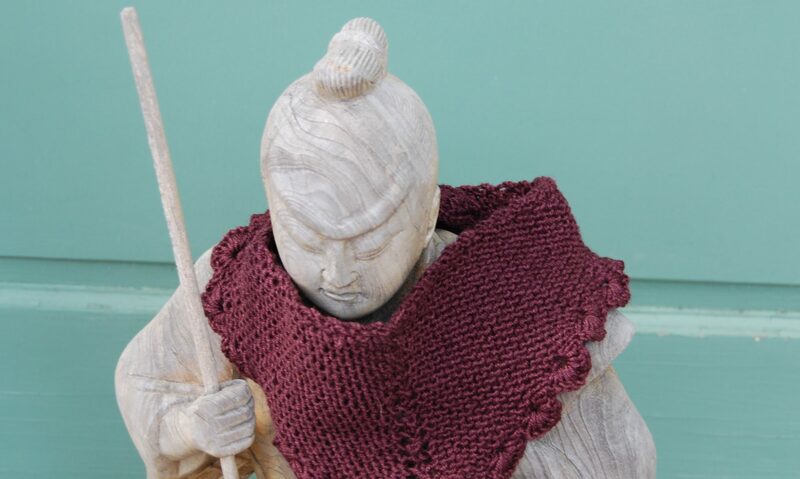 The cowl I’m knitting had so much smoke and bad vibes knit into it that it needed the cleansing. The rain washed all the smoke and vibes away and the cowl is left with pure good energy. Instead of choking the recipient, it will lay cozy around their neck. Last weekend I got a chance to score some yarn at A Verb For Keeping Warm in Oakland. 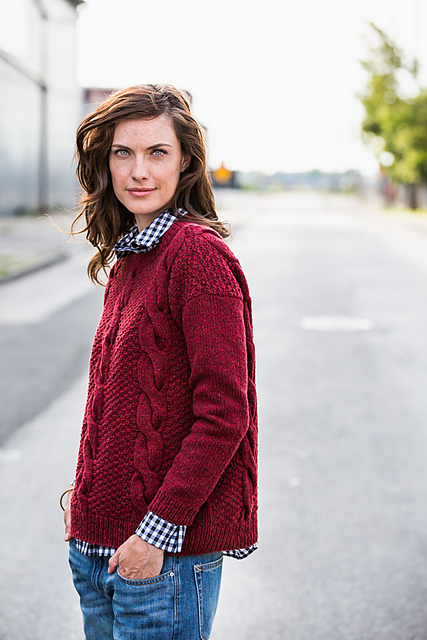 A sweater in the new Brooklyn Tweed collection knocked my socks off. I want to fit into that sweater. I need that sweater, but I’ll settle for Liana having it. 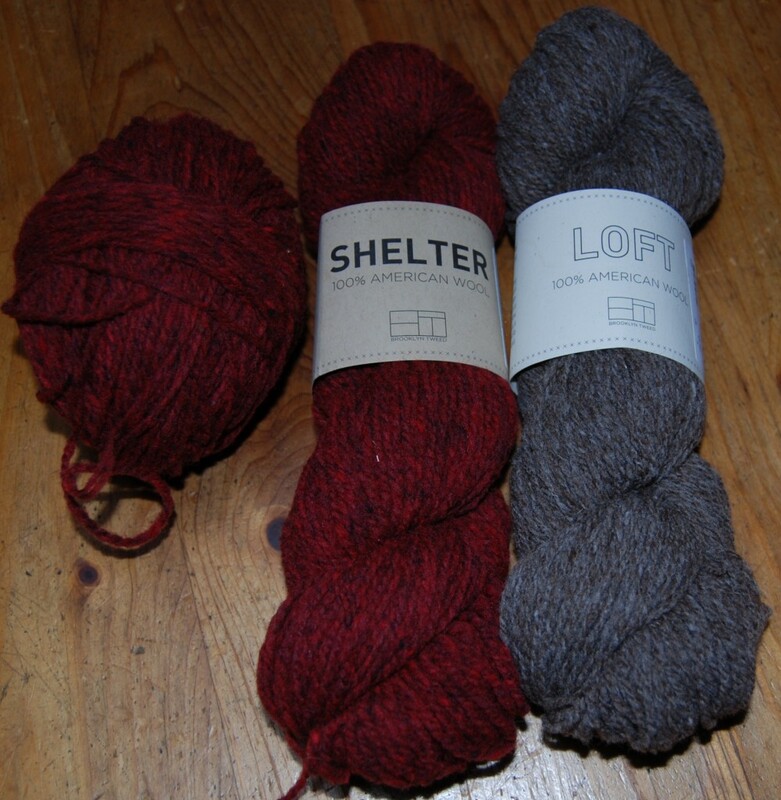 Since the yarn, Shelter, is a little pricey, I got a couple of skeins at Verb to test drive. And while there I thought I’d try some of the Loft yarn. 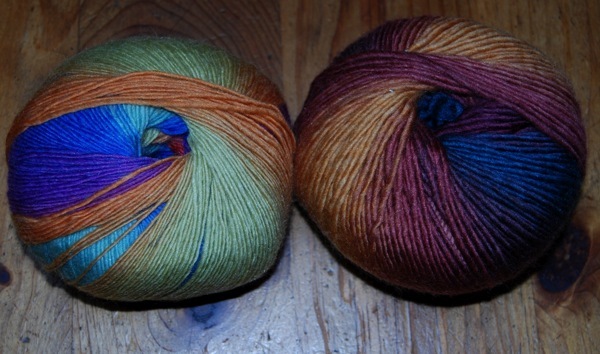 This yarn photographs very nicely, but in reality the colors are much duller. The yarn also tears very easily. When I cast on I tend to pull on the yarn, can’t do that here unless I want shredded yarn. If I cast on very gently it works, when knitting I had no issues. It is the softest yarn. I thought it might be itchy or scratchy, but no, super soft and gentle. That said, I will not be using it for the sweater. The price is too rich and I could not find a color I would be happy with. So I ordered a substitute and am keeping my fingers crossed. Should arrive Saturday. What to do with these skeins? A hat, of course. Unfortunately I not only left yarn money at Verb but also indulged in a little fabric. You know how that goes. I’ll just take a look and since I don’t need fabric I won’t be tempted. Nice try, Marianna. The first fabric to call out to me, actually shouted out, brought memories of my childhood. 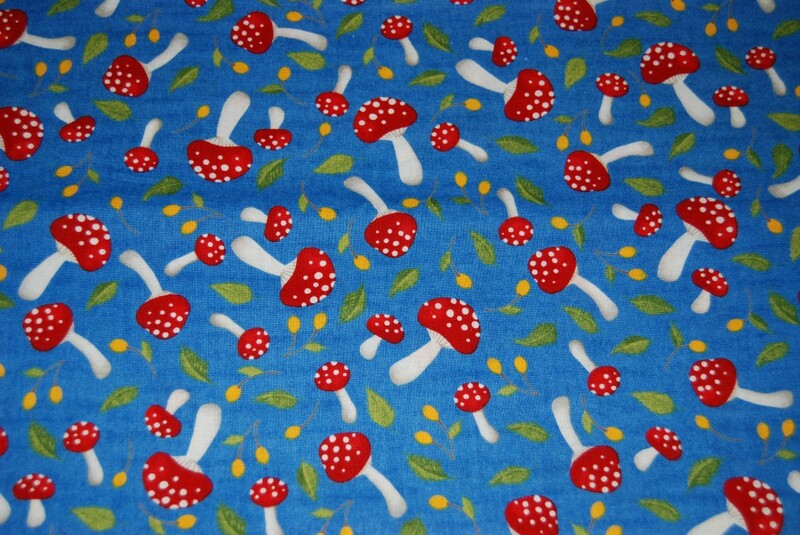 This fabric could have come out of any child’s book I was reading in Germany. And almost, and I really mean almost, I got away, until I discovered the following while she was cutting the previous. From then on, it was shutting my eyes and mind tightly to not let another expense in. So what will I do with the fabric? Why? Do I need to do something beyond stare at it and touch it? 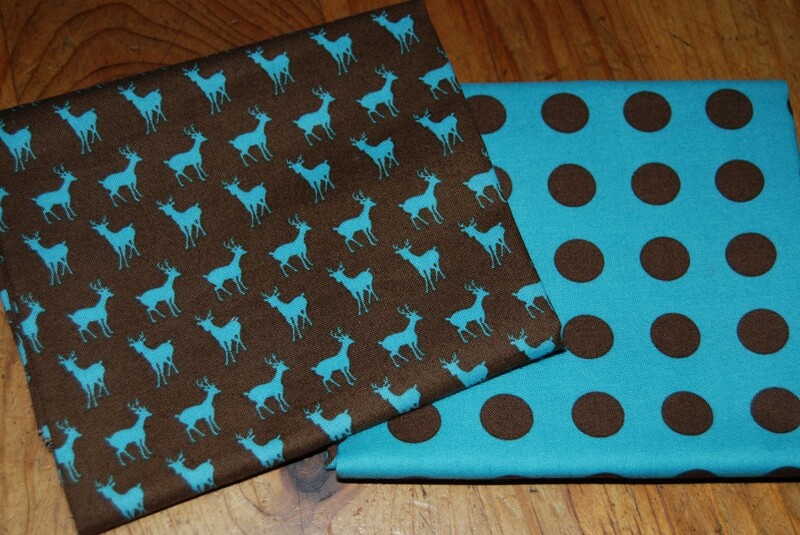 Other people get happy having a glass of wine, I get happy looking at my fabric. And ecstatic and downright drunk looking and touching my yarn. And now to the neglected baby sweater. Oh, the intentions were good. But then the package arrived with the yarn for the next project, and what can I say that I haven’t said so many times before? 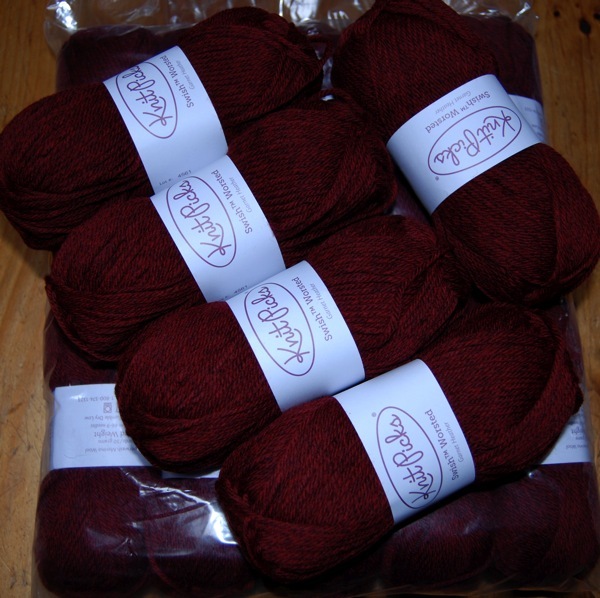 I’m fickle, I’m a yarn addict, I’m a start a new project every day addict…. But I am almost finished. I know it looks an awful lot like the last picture I posted of this little gem, but notice the arms. I still need to weave in lots of ends, sew down the seams all around and add a button band or some sort of band. It’s not that cold yet, I have time. I do, really. Tomorrow I’ll show you the cowl with all the good vibes. I’m a true yarn addict. I don’t even have to look up the word addict, I know I define it. Because I have not mortgaged the house or gone without food because of yarn, I tell myself all is OK. But is it? Here is a sample process. I just received an online yarn purchase. It includes yarn I wanted for a project which I start immediately. 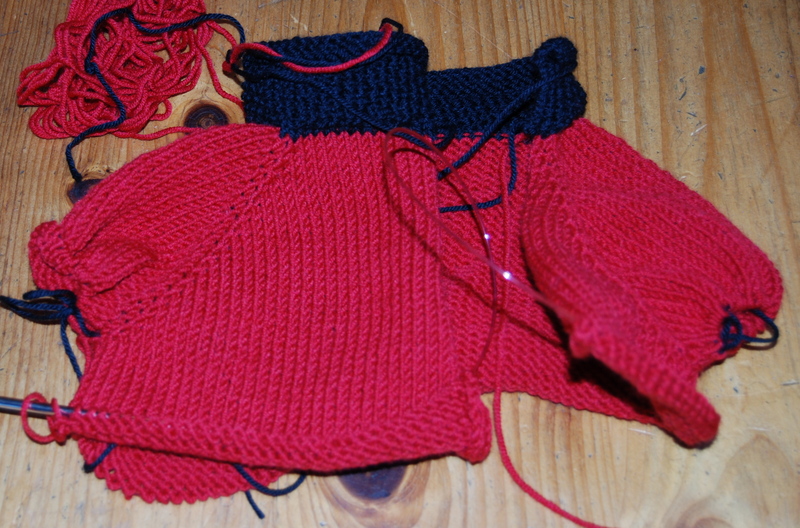 Never mind all the unfinished projects around the house, including the socks started yesterday. A little time goes by, I finish this project and the socks, and find myself on the computer again looking at yarn. Remember, I don’t need any yarn. I have wonderful, delicious, expensive yarn already. Lots of it. And you know why I have that much? Yes, I want that free shipping, an excuse to buy more than needed and it builds a stash. But how about that shawl, I would like to make it but don’t have the perfect yarn for it. Let me see if the perfect skein is out there. Oh wow, look at that one. And look at the sale going on here. Free shipping if I order over $x, well, no problem, I always could use more sock yarn. Trouble starts now, and if I ever was concerned about reaching the free shipping quantity, come on, I know better. 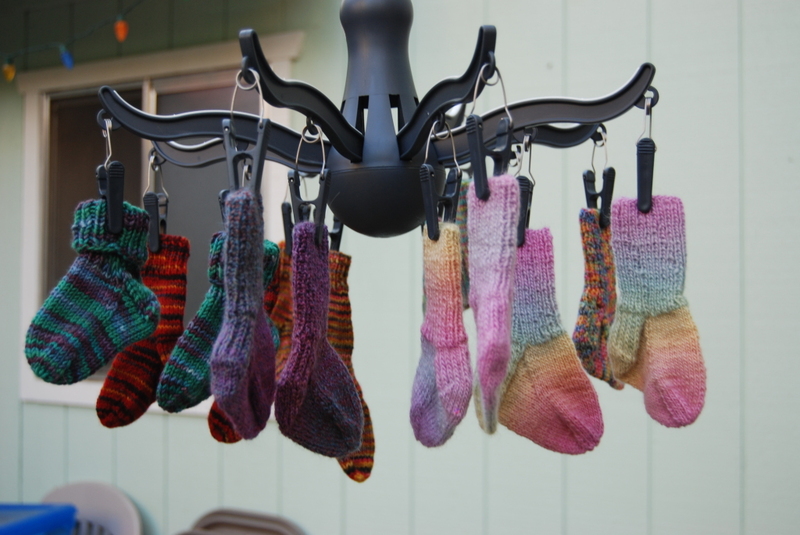 Holidays are already looming for knitters. This is a period of time where no excuses to buy yarn are needed. Or a baby on the way? Buy away! No baby on the way? Just in case your kids will ever have them, knit in advance, you never know how long you’ll live. The reasons are endless, probably as long as the reasons for having that next drink. Except our reasons make more sense because we produce. We can do a show and tell without stumbling around embarrassed. But really, do I need all the shawls I’m knitting? I never wear any, so who are they for? I just don’t want to be saved from my addiction. Not yet. What stage am I? I admit to being an addict, yet don’t see a need to change that. It’s not that bad, I say. I’m not hurting anyone. Or here are some other reasons to keep buying yarn. Knitting reduces my stress, it relaxes. I only buy when I need to make gifts. A yarn addiction is much safer than using drugs or alcohol, though some of us knit with that glass of wine next to us. I don’t buy everything I like. My stash is much smaller than so-and-so’s. I don’t buy the most expensive yarns. 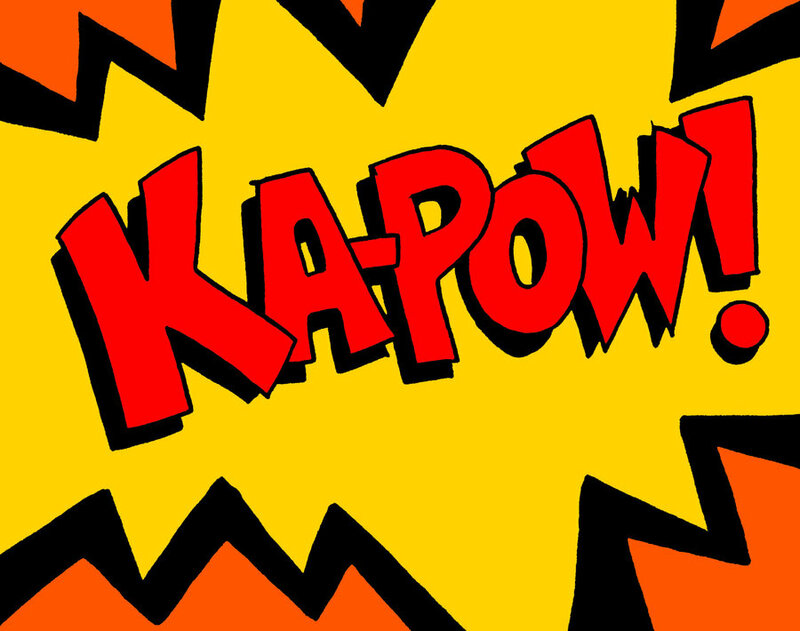 Add your own here…. The excuses are mostly true, not so with a drug addict’s excuses. Does that make me a better addict? If I get hung up on a yarn, I need to buy it or obsess on it until I buy it or another yarn comes along. There is always this other yarn. There are so many choices today. OK, here is what I told my husband and actually believed at the time these words were spoken. I think I have now tried about every sock yarn there is, except perhaps one or two and once I try those, I’m done. I’ll only have to buy sock yarn when I actually need it and then know what kind to buy. Two sock yarns I haven’t tried? And I believed that? True addiction. I have bought two different kinds since then and have many more on my waiting list. What else is going to come out of my mouth? Edit: I’m reminded of a friend who knits. She wants to make a pair of socks, she goes out buys the yarn and makes those socks. She feels on solid ground to me. Realistic. I live in the land of possibility. I live on a cloud surrounded by soft, squishy yarn and many ideas swirling around of patterns I could knit up. Dreamer. There are times I would rather be in control, but not that much.